Adds a new icon beside the Rift Menu bar. I created this addon because I run so many addons and quite a few have their own slash commands. So instead of looking them back up everytime I needed one because I am always forgetting, I can now just enter them into the addon and click on them. 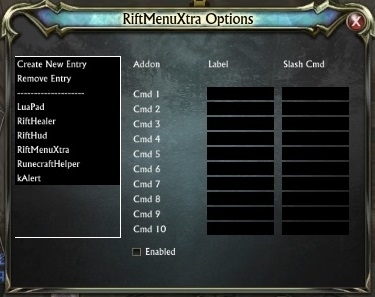 Keep in mind when moving the Rift Menu bar around your screen, the addon button will always be to the right of the menu. You can toggle in options if you want the menu to grow up or down though. Left clicking opens the menu up, just like the built in menu buttons. Right clicking will open the configuration screen. Here you can add, remove and edit addons. The first column (Labels) is what you want to show in the menus, the second column (Slash Commands) is the addon slash command you would normally enter in the chatbox. Menu orientation can now be toggled in options. Menu can grow up or down. Fixed a problem where saved variables werent loading correctly. 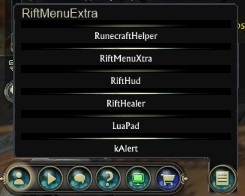 Would be nice to be able to move the "RiftMenuExtra" icon or be able to import it into the docker addon so it's not hanging around the right side of the screen. Nice idea for an addon though, thanks. Working on it. As soon as I get a reply from Adelea I will try to release it. I have the button going to docked but it still stays visible when all other icons in the docker autohide. For those who move the Rift Menu around the screen, you can now toggle the menu growth direction, up or down. The addon button is still on the right side of the Rift Menu. Uploaded a new version, should fix the variable bug. Not working out of box. Sounds like you are having a problem with the saved variables, as all the errors showing have to do with the main variable. Not sure what to tell you as im not having problems with that with a fresh install. I also have my brother helping me test addons as I create them and he has had no problem either. Try reloading the addon, typing /rmxtra reset, and then /reloadui. If that doesnt fix it then the problem is definately with you having a problem with the variables not being saved. As for the addons that are preset in the addon, on load if those addons arent found then they are disabled in the menu. Even if you add another addon and then disable the addon, it will hide it as well. Adding an addon to the Menu isn't working. Label name isn't showing to the leftside. 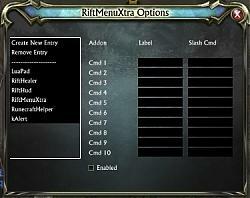 And after trying that all the addons that were shown before when clicking the RiftMenuXtra button are gone. It only shows the name from the button now. Last edited by Zeyina : 08-16-13 at 04:16 AM. Not everyone has their map at the bottom of the screen. The context menu needs to accommodate this. You mean the menu bar? I dont have it attached to the map.